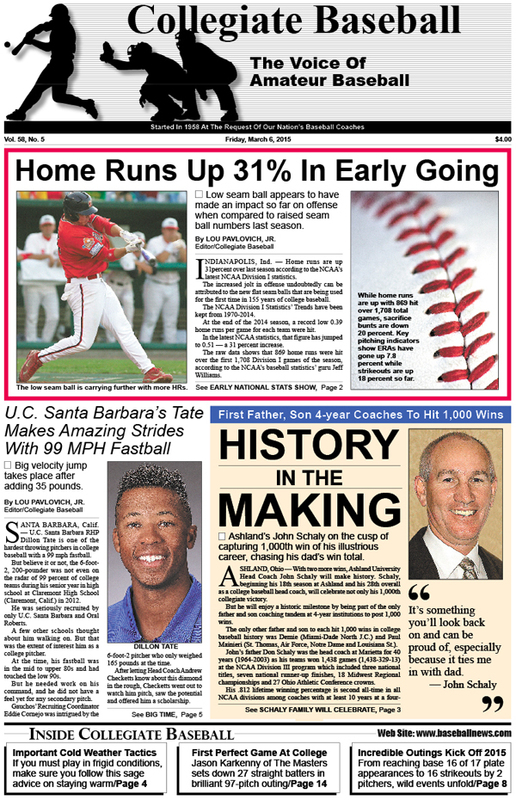 • Special Report: Home runs are up 31% in NCAA Division I baseball after using flat seam baseballs. Plus, we take a look at all of the other key statistical trends and how they are shaping up early in the season so far. • Making History: John and Don Schaly will become the first father and son coaches at 4-year institutions to hit 1,000 victories. • Close Up: U.C. Santa Barbara RHP Dillon Tate has come a long way since his high school days as he now throws 99 mph and has gained 35 pounds of muscle. • Incredible Gift: Former Wake Forest player David Couch commits $4 million in support to the school’s baseball program and Sports Performance Center. • Editorial: All of baseball should study in-depth report done by John Mugarian on why weight training may be at core of Tommy John surgery epidemic in game. • Cold Weather Tips: Here are a number of important tactics to utilize when playing baseball in frigid conditions. • Brian Cain: Here are more tips on obtaining chemistry, leadership with a baseball team in part 2 of 3-part series..
• Ruleball With Rich Marazzi: Line drives can catch coaches and runners by surprise if they aren’t careful. • NCAA Division I Notes: Virginia wins 18-inning marathon over Marist, 5-4, inside-the-park homer hit, wind chill hits 21 degrees during one game as 17 walks take place and 8 combined errors, plus much, more. • National Players of The Week: Collegiate Baseball honors five amazing players for their achievements. • NCAA Division II Notes: Wild 6 home run game gives Erskine coach Kevin Nichols his 500th career win, 2 no-hitters thrown, triple play turned, Angelo St. LHP Steve Naemark strikes out 15 batters during 2-1 win over Regis and much more. • Charlie Greene Coaching Tips: Learning changeup early in one’s career can only help. • High School Notes: 2015 High School tournaments feature top teams, players across the nation. • NCAA Division III Notes: USA’s most courageous athlete, Rowan’s Richie Suarez, endured 40 months of treatment for leukemia before attending college. Besides chemotherapy, he underwent bone marrow biopsies, spinal taps and cranial radiation. And that was only the beginning of this torture chamber from hell. • Tom Kovic: Coaches utilize many recruiting tools to snag baseball players. • Junior College Notes: Four special coaches will be inducted into NJCAA Baseball Coaches Association Hall of Fame, Luis Silverio of Eastern Florida hits for the cycle, Sarah Hudek, 5-foot-10 southpaw pitcher, signs to play at Bossier Parish (LA) Community College and much more. • NAIA Notes: Jason Karkenny of The Master’s College fires the first perfect game in school history, another pitcher throws a no-hitter, and Cumberland is having a tough start to their season with an 0-7 record, plus much more. • Duke Dickerson: Success of baseball programs can be driven by business model. To purchase the March 6, 2015 edition of Collegiate Baseball, CLICK HERE.